Short novels are movie-length narratives that may well be the perfect length for science fiction stories. 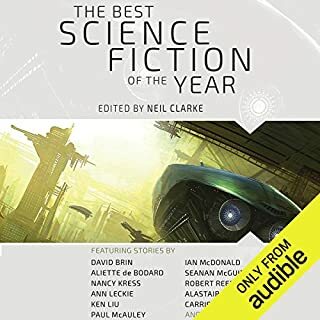 This audio collection presents the best-of-the-best short science fiction novels published in 2013 by current and emerging masters of this vibrant form. In Earth I, by Stephen Baxter, a search among the stars to ferret out the origins of mankind amidst the Xaian normalisation digs up many surprises. In Success, by Michael Blumlein, a brilliant but erratic biologist studying epigenetics struggles to hang onto his grip on everyday life as he writes his ground-breaking tome. 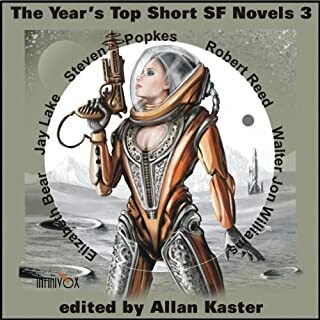 In Feral Moon, by Alexander Jablokov, the Alliance military is invading Phobos to retrieve dead bodies for later repatriation, but stiff resistance is putting the operation into serious doubt. 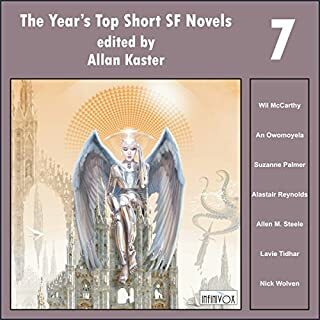 In The Weight of the Sunrise, by Vylar Kaftan, winner of both the Nebula Award and the Sidewise Award for Alternate History, the Incan empire is offered a vaccine, to contain a smallpox out-break, by a Virginian raising funds for the American war against the British. In One, by Nancy Kress, a boxer down on his luck gains the ability to read minds and grapples round-after-round with the consequences. 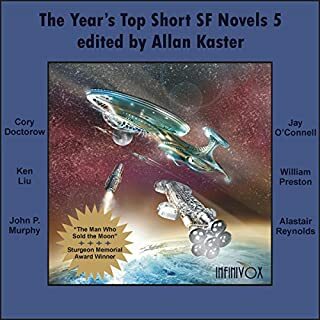 In the Great Ship story Precious Mind, by Robert Reed, an immortal captain who has been living incognito for hundreds of years is kidnaped to help salvage an ancient derelict spaceship. Finally, in the Poirot-like mystery, Murder on the Aldrin Express, by Martin L. Shoemaker, murder is suspected in the death of the leader of a Mars expedition when evidence of sabotage is uncovered. Some of the stories were better than others. The narration and sound quality on Earth One was terrible. No not because of this book. If not read by these people. Human voice, better recording, no echo, level volume, sibilance, this is just so bad. Very very very bad recording. I found the stories of this volume good but tedious at times. The plots of the majority held up to scrutiny. The main exception is the second to last. While it had an interesting outline, it was explored with the most absurd character philosophies and decisions. Also the sound quality of this track is almost intolerable. This in it self doesn't make me feel my time was wasted but it will make me hesitate to purchase these volumes further. If the quality of this grouping is an example of the future hesitation is warranted. 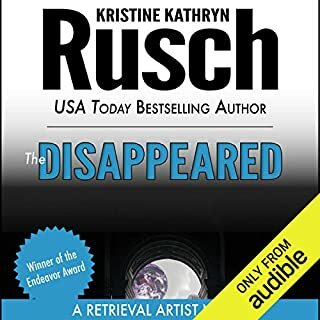 The narrative content was as expected but the recording quality and the talent varied. Listening to Baxter's story was like listening through a pipe.